I thought that "trade" was "just trade". Does the number of planets with trade ports make a difference in the amount of $ you make from trade? Does the length of the longest "route" (that white line I'm guessing) have a bearing on trade $$ made? As you guessed, exactly how many credits that $ stands for can vary based on several things. Research, abilities, planet bonuses, but most importantly the length of your longest trade chain (yes the white line). For each planet in your chain, every trade port in your empire (even those not on the chain) get a 7.5% trade income bonus, which is basically a free trade research. However, exactly how its calculated is trick. Your trade chain is the "longest shortest" trade route in your Empire. In other words, your trade route will not ignore planets with trade ports to make your chain longer, you cannot let there be shorter paths connecting parts of your chain. Planets that just branch off but don't go anywhere else on the chain are fine, but anything that might be a shortcut you'll have to avoid putting trade ports there. As complicated as it sounds, its actually pretty intuitive after you pay attention to that white line for a bit. They work in the way that trade routes will automatically try to create the shortest path possible to the farthest trade port. Basicly the top strategy has a trade port on every planet, but the longest trade route becomes shorter because it wll allways try to get the shortest route. The bottom one has a much longer trade route and will earn more. Pay attention to any planets with a trade % boost, might have to be explored to find it. Earth and desert planets are great for trade routes due to their high logistic slots. Put star bases with trade upgrades in uncolonizable grav wells to increase the chain. Some grav wells prevent abilities and will block starbase construction as well. They are pink/purple clouds not every one, but some. The base income of tradeport is 1.0 credits per second on Slow speed (Speed with income bonus of 0). 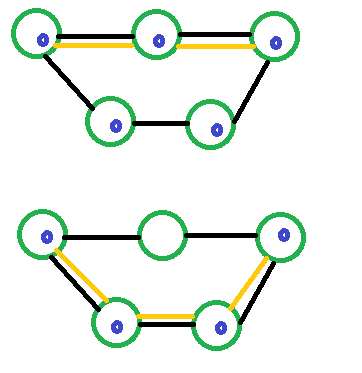 Each node in the chain provides additional multiple of .075% So the income can be calculated as 1+(.075*(N-1)) where N is the number of nodes in the longest route. still, great chart though....so you and Black Ni are saying that it is better to have multiple Trade Ports on the SAME planet separated by a great distance from another planet ALSO with multiple Trade Ports instead of a single Trade Port on every planet in between? Putting a trade port at every planet can ruin a trade line yes. But if you do build a good trade line then try to fill all those planets in that trade line with as many trade ports as possible. Each tradeport in your empire will give the same amount of credits once it has spawned all 10 of its tradeships (of course starbase tradeports give a bit more, I'm talking about regular ones). So in theory, it doesn't matter where you put the tradeport so long as it doesn't ruin your longest route by creating a shortcut. You can have a bunch of tradeports on a route, and then you can have an additional desert planet not touching the route full of another 9 tradeports, and the tradeports will each produce same income. To be honest that is quite counterintuitive if you ask me. For a trade network the overall number of trade ports should be the main factor, not some longest, shortest! route. I wonder why they decided to make this "trade post posting" such a complicated minigame. Well you can ignore it if you want. Most of the time you can just build trade ports everywhere and make just as much money, they're that OP. But I kind of like it because it means different planets are better placed to do different things. In general its easiest to make a trade line on the outer planets of the system, while refineries prefer planets with other resource rich planets near them, and culture works best on center planets with lots of phase lanes. The longest route concept is borrowed from Settlers of Catan, one of the game makers' favorite game. I played it myself, and I don't really like it much. Anyway, it's a pretty good concept, and it ads a bit of strategy to the game beyond "make another tradeport."